All use of animals in these experiments, including surgeries and euthanasia, were performed at the New York University (NYU), following the Institutional Animal Care and Use Committee approval. The current gold standard of care for alveolar (constituting the part of the jaws where the teeth arise) bone clefts or any bone defects is an autologous (involving one individual as both donor and recipient) bone graft, which are associated with their respective shortcomings (e.g. bone resorption, infection, poor local blood supply) that have driven progress in tissue engineering for an alternative solution. This pilot study was twofold: first, to establish a critical-sized alveolar cleft defect in a translational, skeletally immature rabbit model for future investigation. 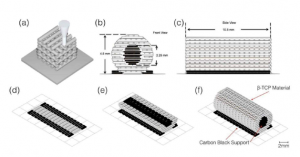 Second, to assess the regenerative potential of 3D-printed bioactive ceramic (3DBC) scaffolds. Four skeletally immature (~4 weeks old; ~1kg) New Zealand White rabbits underwent unilateral, ~3.5 mm x ~3.5 mm, alveolar cleft defect creation by means of an oral surgery burr (a small rotary cutting tool) with defects remaining untreated as negative controls. After 8 weeks, the animals were euthanised, the region was harvested en bloc and evaluated for bone formation. Samples were scanned with a microCT and evaluation was completed utilizing Amira 3D software, for quantitative analysis of new bone regeneration. Mean bone regeneration was calculated with 95% confidence intervals. Qualitative bone formation was assessed with non-decalcified histologic sections. Gross examination demonstrated and micro CT imaging revealed that the controls had alveolar cleft defects that remained unhealed at ~3.5mm x 3.5mm. The negative controls were of critical-size in the alveolar cleft, while defects treated with a 3DBC scaffold demonstrated bone regenerative potential across the defect at 8 weeks while maintaining suture patency. Cleft lip and palate defects are one of the most common craniofacial deformities affecting newborn children. The incidence of this deformity varies by country and can stem from genetic deficiencies, maternal environmental factors such as alcohol or medication during pregnancy, along with other etiologies (causes). In the United States of America, the Center for Disease Control (CDC) had reported that approximately 2,650 newborns are born with a cleft palate (Figure 1) and 4,440 newborns are born with cleft lip with or without a cleft palate. Additionally, an alveolus cleft may be associated with a cleft lip and/or palate deformity. The alveolar bone is a thin layer of bone that forms around the tooth sockets. The primary cause of an alveolar cleft is due to the lack of fusion of the medial nasal process and the maxillary process leading to a fistula (abnormal passage) or communication between the oral cavity and nose. Figure 1: This sequence of images illustrate a cleft palate in an infant, image (A) shows incomplete unilateral cleft of the lip; (B) displays unilateral cleft of the lip, alveolus, and palate; (C) demonstrates bilateral cleft of the lip, alveolus, and palate; (D) shows an isolated (median) cleft palate. Treatment of alveolar cleft is generally approached with bone grafting, most commonly with primary bone grafting, “elimination of bone deficiency, stabilisation of the pre-maxilla (bones of the upper jaw), creation of new bone matrix for eruption of teeth in the cleft area and augmentation of the alar base.” While the most common bone for grafting comes from the iliac crest (the thick curved upper border of the ilium), as it is relatively easy to harvest, can provide a large amount of cancellous (having a porous structure) bone, and cleft preparation can be performed simultaneously. Harvesting iliac bone for grafting does present certain complications such as an incision at the hip, which can result in donor site morbidity including pain and difficulty with ambulation. In addition, this procedure may result in an unpredictable amount of bone resorption. Such limitations have driven research for alternative approaches to treating alveolar clefts, such as tissue engineering. To date, in vivo (in the living body) studies assessing the bone regenerative capacity of synthetic scaffolds, particularly 3D printed bioactive (having an effect on a living organism) ceramic scaffolds, have been limited. 3D-printed bioactive ceramic (3DBC) scaffolds are a novel and viable alternative for treatment of bony defects, such as the cleft. While still in the pre-clinical phase, 3DBC scaffolds encompass various beneficial properties such as being osteoconductive, biocompatible and the ability to be customised depending on the patient’s defect. These bioactive ceramic scaffolds are calcium phosphate based, specifically, beta tricalcium phosphate (β-TCP). β-TCP presents a steady resorption, in comparison to other bioactive ceramics, such as hydroxyapatite, and when used as a scaffold device, it simultaneously counteracts soft tissue infiltration into the defect to permit bone growth. These 3DBC scaffolds are osteoconductive, allowing bone to grow on a surface, and help with osteogenesis, providing ingrowth of capillaries, bone cells, and bone tissues. These fabricated scaffolds may be fully customised with the assistance of computer aided design (CAD) software and a custom robotic 3D printer (Figure 2). This level of customisation helps fabricate the optimal shape and geometry based on the patient’s scans prior to the operation (Figure 3 and 4). 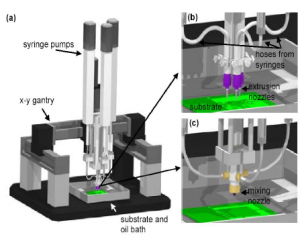 Figure 2: Schematic of robocasting machine currently in use at the NYU College of Dentistry Biomaterials lab, this machine was designed by 3D Inks, LLC (Tulsa, OK). Figure. 3: CAD of scaffold (11-mm length, 9-mm major axis outer diameter, 4.5-mm minor axis outer diameter, 5-mm major axis inner diameter, and 2.5-mm minor axis inner diameter (lumen); (A) iso view (B) front view, and (C) superior view. CAD = Computer Aided Design. 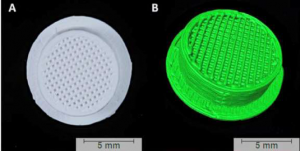 Figure 4: 3D-printed bioactive ceramic scaffold composed of β-tricalcium phosphate. (A) Inferior surface of the scaffold showcasing the porous core with central lattice. The scaffolds were placed in the trephine-induced calvarial defects such that this latticework faced the dura. (B) 3D reconstruction of the scaffold created using Amira 6.1 software (Visage Imaging GmbH, Berlin, Germany). The scaffold’s architecture is deliberately designed to facilitate bone regeneration. In the past, scaffolds were not intricately specialised with respect to internal geometry as there were no earlier results which suggested benefits to osseointegration, formation of a direct interface between a device and bone, without intervening soft tissue. To date, research has demonstrated that an organised lattice network of β-TCP has the potential to improve bone growth at the site of the bony defect. Other factors that assist with improving bone growth are site preparation, quality of the bone where the scaffold will be placed, and the overall size of the implant itself. These influences express how these bioactive scaffolds integrate with bone within these bony defects. This experiment’s purpose is to evaluate the potential of bioactive ceramic scaffolds and their bone regenerative potential. The first aim of this research was to design and develop a critical sized alveolar model in a skeletally immature rabbit. The second aim was to evaluate scaffolds efficacy/potential to facilitate bone regeneration of bony defects. Custom 3DPC scaffolds are designed for specific defects and models, which are created through computer aided design software, RoboCAD 4.3 (3D Inks, LLC Tulsa, OK). This software permits the user to design the scaffold to the site of the defect, such as the cleft (as described above), mandibular segmental (Figure 4), or a radial bone defect (Figure 5). Once the design is finalised, the code is saved and sent to the 3D printer, which follows a predefined tool path and extrudes a colloidal (a substance that consists of particles dispersed throughout another substance ) gel suspension in a layer-by-layer fashion until the object is finished. As the final print out is a ceramic it is subjected to a post processing step of sintering, to 1100°C in order to densify the material. Figure 5: Schematic of extrusion nozzle depositing filaments of material on a layer-by-layer basis and Robocad 4.3 rendition of the designed long bone scaffold, image shows front and side, respectively. All use of animals including surgeries and euthanisation were performed at the New York University (NYU), following the Institutional Animal Care and Use Committee approval. Following inspection, the rabbits were allowed to acclimatise for 7 days, prior to the first surgical intervention. First, the animals were prepared for surgery and then attached to an automated system for continuous monitoring of their pulse, heart, respiratory rates, oxygen saturation, body temperature, and coloration. Surgical drapes were placed over the rabbits and strict sterile conditions were maintained throughout the surgeries. The rabbits were constantly monitored before, during and post-operatively to ensure they properly regained consciousness. After regaining consciousness, the rabbits were monitored twice a day for 48 hours and then once a day for the duration of experiment. The rabbits were euthanised via anesthesia overdose at the end of the 8-week time period. Once the rabbits were anaesthetised for the surgical procedure, a 13-mm skin incision was made on the right side of the midface to expose the maxilla. Once exposed a defect template measuring, ~3.5 mm x ~3.5 mm, was placed on the bone and the defect was created using an oral surgery burr. The defects remained empty/untreated for the duration of the experiment in an effort to validate the defect was of critical size. Animals were administered buprenorphine (0.01 mg/kg) and enrofloxacin (5 mg/kg) every 12 hours for 48 hours post-operatively. Upon the end of the experimentation period, 8 weeks in vivo, maxilla were retrieved en bloc by sharp dissection. Samples were dehydrated in a series of ethanol (70%-100%) solutions and embedded in a methyl methacrylate (MMA) resin. The samples are then ready to be cut into slices. Thin slice (~250μm) sections were acquired using a slow speed saw (Isomet 2000, Buehler Ltd., Lake Bluff, IL, USA) with a diamond blade (Figure 6). After obtaining thin slices, sections were glued to a histological slide. Then using a grinding machine (Metaserv 3000, Buehler, Lake Bluff, IL, USA) and water irrigation samples were treated with a series of SiC abrasive paper until approximately 130μm thick. The recommended method to glue the slice is at an angle with a thin layer of plastic to protect the sample when it is being clamped to the slide. Once the glue and plastic layer were placed, the slide was checked for air bubbles and was fixed simply by applying pressure using a soft dry eraser. Finally, an eraser and clamp were applied to the slide and kept under constant pressure for twenty hours. Figure 6: (A) Buehler Isomet low speed saw and (B) Isocut diamond wafering blade. Once the samples had been glued, they were subjected to a grinding and polishing process (Figure 7a). Polishing required the slide to be continually measured (using a micrometer or caliper (Figure 7b)) as the optimal slide thickness was ~110μm. Once the desired slide thickness had been achieved, the slides were subject to polishing with alumina suspension, in an effort to eliminate any fine scratches. Once the polishing process was completed, the slides were ready for the staining process. Staining was the final step in slide preparation and is vital for samples to be analysed. The stain was selected based on the deliverables. Most commonly in bone histology, Stevenel’s Blue and Van Gieson Picro Fuchsin Stain are utilised; they stain soft tissue and hard tissue (bone) respectively. 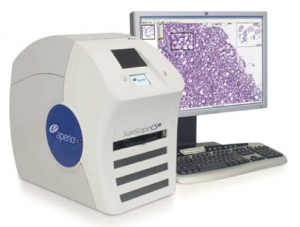 The Aperio Scanscope (Figure 8), an automated microscope developed to autofocus and capture histological slides was utilised to digitally capture images of the slides. This was the final step in the histological process prior to quantitative and qualitative analysis. Slides were fully scanned, images were acquired, and subsequently the region of interest (ROI) was digitally extracted and ready for histological analysis. Figure 7: (a) Buehler Metaserv 250 grinder/polisher and (b) caliper. The digitally exported files were then analysed with Adobe Photoshop or ImageJ software. [16-17, 19, 22] When using Photoshop, the image required some pre-processing steps such as reduction in size (pixels or resolution), while maintaining its original aspect ratio. Then the stained sections were examined using a histology slide for the amount of bone, soft tissue, and graft material within the defect. Using colour selectors for the different materials in the site, the relative percentage of the defect space occupied by each type of tissue or graft was quantified through customised computer software (JVAnalysis-Jerry Chiu, Department of Biomaterials, New York University, NY) by measuring the respective areas of each material. An alternative approach to alveolar cleft reconstruction, especially in young children, still remains an unanswered question. The experiment evaluated a method, verified a dimension of critical size in a skeletally immature rabbit, and explored 3DBC scaffolds and their potential as a viable solution for bone defects. Bone was quantified as a function of regeneration/growth within scaffold interstices. Volumetric rendered data revealed that negative controls remained unhealed with limited bone growth at defect margins observed. While non-decalcified histologic sections depicted negative controls to remain critical-sized, and no inflammatory response was observed. The results from this portion of the experiment were of relevance; the researchers were able to successfully create a critical sized defect. With the aforementioned aspect successfully completed, boney defects do need a device, autologous or synthetic, in an effort to facilitate in bone regeneration. As previously described, autologous bone grafting is the gold standard but does come with certain disadvantages, primarily secondary surgical site and limited quantities. With this is mind, synthetic biomaterials such as the 3D printed bioactive scaffolds, with a porous design, have shown promising results in translation models. Two previous animal models done by Bekisz et al. and Lopez et al., evaluated synthetic scaffolds, at different anatomical locations: calvaria and mandibular respectively. In previous studies involving scaffolds, they were constructed from hydroxyapatite (HA), which did have respectable mechanical properties but its low dissolution kinetics made it unfavourable. With those shortcomings of HA, β-TCP has become a viable substitution as a bioactive ceramic, as it has previously demonstrated suitable degradation kinetics, which are of importance in a growing model. This material combined with 3D printed devices, which are custom designed to fill specific defects, with optimally design micro architecture and have indicated successful results as seen in the work by Lopez et al., in the rabbit mandibular model. The work utilised a 3DBC scaffold in critical size defect (~12mm), which, after 8 weeks, bone was conducted through the scaffold and integrated successfully with the native bone at both anterior and posterior regions. Results such as these indicate that surgeons may soon have potential viable alternatives, such as these custom devices, and will not have to rely on autogenous bone for complex reconstructions. The author would like to acknowledge New York University College of Dentistry’s Department of Biomaterials for the opportunity to work on this research project. Additionally, thank you to Drs. Paulo G. Coelho and Lukasz Witek for their guidance and support. Thank you also to Mr. Christopher D. Lopez for his time, patience and help in preparation of the samples and proofing of this research write-up. “Alveolar”, Merriam-Webster, accessed November 10, 2018, https://www.merriam-webster.com/dictionary/alveolar. “Autologous”, Merriam-Webster, accessed November 10, 2018, https://www.merriam-webster.com/dictionary/autologous. “Burr”, Merriam-Webster, accessed November 10, 2018, https://www.merriam-webster.com/dictionary/burr. Jing Guo, Chunjie Li, Qifeng Zhang, Gang Wu, Scott A. Deacon, Jianwei Chen, Haikun Hu, Shujuan Zou and Qingsong Ye, “Secondary bone grafting for alveolar cleft in children with cleft lip or cleft lip and palate”, Cochrane Database of Systematic Reviews, 6 (2011), https://doi.org/10.1002/14651858.CD008050.pub2. “Fistula”, Merriam-Webster, accessed November 10, 2018, https://www.merriam-webster.com/dictionary/fistula. Christian Stoll, Senait Mengsteab, Doris Stoll, Dieter Riediger, Axel M. Gressner and Ralf Weiskirchen, “Analysis of polymorphic TGFB1 codons 10, 25, and 263 in a German patient group with non-syndromic cleft lip, alveolus, and palate compared with healthy adults”, BMC Medical Genetics 5, 15(June 22, 2004), https://doi.org/10.1186%2F1471-2350-5-15. “Premaxilla”, Merriam-Webster, accessed November 10, 2018, https://www.merriam-webster.com/dictionary/premaxilla. “Iliac Crest Medical Definition”, Merriam-Webster, accessed November 10, 2018, https://www.merriam-webster.com/medical/iliac crest. “Cancellous”, Merriam-Webster, accessed November 10, 2018, https://www.merriam-webster.com/dictionary/cancellous. Nak Heon Kang, “Current methods for the treatment of alveolar cleft”, Archives of Plastic Surgery 44, 3(2017): 188-193, https://doi.org/10.5999/aps.2017.44.3.188. “Vivo”, Merriam-Webster, accessed November 10, 2018, https://www.merriam-webster.com/dictionary/vivo. “Bioactive”, Merriam-Webster, accessed November 10, 2018, https://www.merriam-webster.com/dictionary/bioactive. Dietmar W. Hutmacher, “Scaffolds in Tissue Engineering Bone and Cartilage”, Biomaterials 21, 24(December 15, 2000): 2529-2543, https://doi.org/10.1016/S0142-9612(00)00121-6. Jonathan M. Bekisz, Roberto L. Flores, Lukasz Witek, Christopher D. Lopez, Christopher M. Runyan, Andrea Torroni, Bruce N. Cronstein and Paulo G. Coelho, “Dipyridamole enhances osteogenesis of three-dimensionally printed bioactive ceramic scaffolds in calvarial defects”, Journal of Cranio-Maxillofacial Surgery 46, 2(February 2018): 237-244, https://doi.org/10.1016/j.jcms.2017.11.011. Christopher Lopez, J. Diaz-Siso, Jonathan Bekisz, Lukasz Witek, Nick Tovar, Luiz Gil, Bruce Cronstein, Roberto Flores, Eduardo Rodriguez and Paulo Coelho, “Dipyridamole Releasing 3D Printed Bioactive Ceramic Scaffolds with Osseoconductive Geometries Promote Craniofacial Bone Regeneration”, Plastic and Reconstructive Surgery- Global Open 5, 9S (September 2017): 178-179, https://doi.org/10.1097/01.GOX.0000526422.83302.22. Cornelia E. Cretiu-Vasiliu, “Assembly of Hydroxy Apatite: β Tricalcium Phosphate: Calcium Sulfate Bone Engineering Scaffolds”, (MSci diss., Oklahoma State University, 2008), accessed at http://digital.library.okstate.edu/etd/CretiuVasiliu_okstate_0664m_10066.pdf. Christopher D. Lopez, J. Rodrigo Diaz-Siso, Lukasz Witek, Jonathan M. Bekisz, Bruce N. Cronstein, Andrea Torroni, Roberto L. Flores, Eduardo D. Rodriguez and Paulo G. Coelho, “Three dimensionally printed bioactive ceramic scaffold osseoconduction across critical-sized mandibular defects”, Journal of Surgical Research 223, (March 2018): 115-122, https://doi.org/10.1016/j.jss.2017.10.027. “Colloidal”, Merriam-Webster, accessed November 10, 2018, https://www.merriam-webster.com/dictionary/colloidal. Nick Tovar, Lukasz Witek, Pablo Atria, Michael Sobieraj, Michelle Bowers, Christopher D. Lopez, Bruce N. Cronstein and Paulo G. Coelho, “Form and Functional Repair of Long Bone Using 3D Printed Bioactive Scaffolds”, Journal of Tissue Engineering and Regenerative Medicine 12, 9(September 2018): 1986-1999, https://doi.org/10.1002/term.2733. Adham M. Alifarag, Christopher D. Lopez, Rodrigo F. Neiva, Nick Tovar, Lukasz Witek and Paulo G. Coelho, “Temporal osseointegration: Early biomechanical stability through osseodensification”, Journal of Orthopaedic Research 36, 9(September 2018): 2516-2523, https://doi.org/10.1002/jor.23893. Zeeshan Sheikh, Shariq Najeeb, Zohaib Khurshid, Vivek Verma, Haroon Rashid and Michael Glogauer, “Biodegradable materials for bone repair and tissue engineering applications”, Materials 8, 9(September 2015): 5744-5794, https://doi.org/10.3390%2Fma8095273. 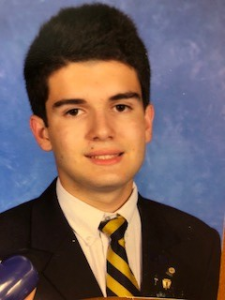 Jorge H. Rodriguez is a senior at Belen Jesuit Preparatory School in Miami, Florida. One of his many passions include performing research in the medical field. He spent the last two summers doing research on cleft palates and lips. During his free time he enjoys reading comic books and spending time with his friends at the local movie theater. Great article and investigative accomplishment. Good to see our young generation involved in these type of research and experiments.